Τhe time of Justinian has attracted for a long time and continues to attract the attention of historians. 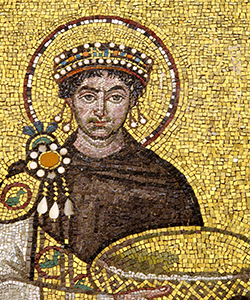 The understanding of Justinian's personality, his achievements and failures, are so overwhelmingly important for the history of Late Antiquity and Byzantium that analysts and syntheticists alike have produced an abundant literature on the subject. However, their solutions have created new problems, and have made necessary the revision of accepted points of view. Several papers in the present volume are dedicated to a particular aspect of Justinian's political, social, and religious policy: his dealings with the various groups of Christians of the East. My purpose is to introduce the subject and to examine Justinian's attitude toward religion, toward individual religious groups, toward the Church, and toward the theological problem of Christology, which produced in the fifth and sixth centuries the first major and lasting schism in Christendom. I. The problem of the Emperor's role in the religious affairs of an Empire which he extended again from Mesopotamia to Spain. II. The theological problems existing between the official Chalcedonian position and the Monophysites in the sixth century. Reaching the imperial throne in 527, at the age of 45, a mature man with a reasonably long experience in government as principal adviser to his uncle and predecessor Justin, Justinian proceeded to the realization of a gigantic program of reconquest and restoration. His impressive successes in reconquering Africa, Italy, and Spain not only bear witness to the military power and political skill of his government; they also manifest the extraordinary prestige of the imperial idea itself, in the eyes of both the local populations of the reconquered areas and the Barbarian invaders. Throughout his entire reign Justinian showed constant awareness of this prestige. He was convinced that the strength of the Empire lay not only in the success of its army, but also in permanent struggle against the forces of internal disintegration. While his armies were fighting in the West, the North, and the East, he was constantly busy building the legal, administrative, and economic foundation through which he hoped to ensure the permanence of an empire uniting forever the entire Christian oikoumene . His religious policy obviously expressed the same concern. It was directed, on the one hand, toward the final liquidation of dissident groupspagans, Samaritans, Christian hereticswhich were small enough to be dealt with by simple administrative measures, and on the other toward a severe limitation in the civil rights of those whose simple annihilation was either impossible or undesirable. The Jews found themselves in the last category, but the Monophysites presented by far the major problem. Professor Francis Dvornik in his article on "Emperors, Popes, and General Councils (1) has brilliantly shown the political importance acquired by ec­clesiastical councils in the post- Constantinian era. Gathered and regulated by the emperor, they were expected to produce definitions of faith which would be regarded as imperial law. However, it can be safely said that one of the major disappointments of Constantine and his successors has been the legal ineffectiveness of the system. A law, when issued in a proper form by the proper authority, could not be questioned by law-abiding Roman citizens. Yet every single council gathered since the beginning of the Christian empire, was challenged by a more or less substantial opposition: Nicaea by the vast majority of Eastern Christians, Constantinople by Alexandria and Rome, Ephesus by Antioch; not to speak of the various arian councils, whose rejection by the Orthodox was, in the time of Justinian, glorified as a heroic confession of the true faith. And if Nicaea, Constantinople, and Ephesus ended up by being recognized in the major centers of Christendom, this recognition was never unconditional. The East accepted Nicaea only when the Cappadocian Fathers produced the necessary clarification of the όμοούσιος , clarification which was long regarded as suspect of tritheism in the West. The West, meanwhile, accepted only tacitly the Council of Constantinople (381) and without really agreeing with either the doctrine of the "three hypostases or the famous Canon 3, which gave to the church of Constantinople "privileges equal to those of old Rome. The Council of Ephesus, finally, was accepted in Antioch, only after a written "formula of union could be agreed upon in 433. There is no doubt that the emperors of the second half of the fifth century especially Zeno and Anastasius had these precedents in mind when they had to face the fierce opposition of vast numbers of Eastern Christians to the Chalcedonian definition. This is why, one after the other, they preferred to solve the ecclesiastical issues of the day themselves and, avoiding conciliar procedure, to publish decrees on the faith; the most important of those decrees, the Henotikon of Zeno (482), was legally enforced until 518, when it was officially rejected by Justin I, probably upon the advice, and certainly with the agreement, of his nephew Justinian. These imperial attemptsnone of them successfulwere directed at the pacification of the Eastern Church, torn apart between the adherents and the opponents of the Council of Chalcedon. The rigid Chalcedonian policy of Marcian and Leo, a logical follow- up of the Council itself, proved that coercion alone could not maintain Chalcedonian bishops in the major Oriental sees of Alexandria and Jerusalem. But the opposite policy, favoring Monophysitism , did not work either; the Encyclical of Basiliscus (475), disavowing Chalcedon, was successfully opposed by Acacius of Constantinople. And the Henotikon itself, the archetype of doctrinal compromise, in spite of a brief initial success in restoring unity between Constantinople and Egypt, soon proved unworkable. On the one hand, its essential ambiguity failed to prevent the continuation in the East itself of the old struggle between Dyophysites and Monophysites ; on the other hand, its acceptance by the Empire led to irreconcilable opposition on the part of the Christian West, led by the Roman bishop. Thus, during the entire second half of the fifth century, while no one was prepared to deny in principle the established authority of the emperor in religious affairs, in fact all of the really convinced minorities of each theological party were eventually ready to challenge imperial will, if only it opposed their fundamental convictions. Neither did Martian and Leo succeed in imposing their will upon Timothy Aeluros of Alexandria and the Church of Egypt, nor could Anastasius force the patriarchs of his own capital to endorse his Monophysite interpretation of the Henotikon . However, both Monophysites and Chalcedonians were happy to enjoy imperial support against each other, when such support was made available to them. Thus, in 518, when Justinian, with his wide imperial ambitions, gathered up the reins of power under the patronage of his uncle Justin I, he had to face a rather paradoxical situation: as a result of the policy of Anastasius , two major ecclesiastical centers, Alexandria and Antioch, were solidly under Monophysite control and enjoyed the very able leadership of the best theologian of the post- Chalcedonian Greek East, Severus of Antioch. Constantinople and Palestine were the only reliable centers of Chalcedonian orthodoxy in the East. However, the Church of the New Rome was deprived of the support which it could have expected from the pope of the Old Rome, because the bishops of Constantinople, while solidly Chalcedonian and even suffering for their faith under Anastasius , were keeping in the diptychs the name of Acacius , the architect of Zeno's unionist policy. Rejected as  Chalcedonian  by what looked very much like a majority of Eastern Christians, the bishops of the capitalwho were supposed to occupy a central role in the policy of unifying the Empirewere also rejected by Rome as not Chalcedonian enough. Divided in three major segmentsRome, the Chalcedonian East, and the Monophysites the imperial Church could obviously not fulfill its function of unifying the Christian oikoumene . Justinian was thus faced with the apparently in­surmountable task of bringing Rome, Constantinople, and the Monophysites together. To achieve his goal, the Emperor used a variety of tactical methods ranging from direct coercion to free theological discussion with opposition groups. At no time was there in his mind any doubt that the Council of Chalcedon was to be considered a permanent expression of the Christian faith: in his Novella 131, issued in 545, he declared the canons of the four Councils of Nicaea, Con­stantinople, Ephesus, and Chalcedon to be imperial laws and the doctrinal definitions of those Councils, to be sacred writings. For Justinian, faith­fulness to Chalcedon was not only a matter of theological conviction, but also of urgent political expediency. During the reign of Justin, when Justinian was already in charge of ecclesiastical policy, and in the first years of his own reign which coincided with the reconquest of Africa and Italy, reconciliation with the Roman Church was obviously for him a concern of first priority. There is no doubt that in his own mind, the prestige of the "ancient Rome," and hence that of its bishops, was very great; but this prestige was also an essential aspect of his political plans in the West: the Empire simply could not restore its control over its former Western territories unless the emperors and the bishops of Rome acted in unison. On several occasions, especially in letters he addressed to the popes, Justinian mentioned Rome's "apostolicity." In writing to John II in 533, for example, the Emperor "gives honor to the Apostolic see, honors the Pope as "his father," and "hastens to inform him about the state of the churches (2). At no other time in the entire history of the Christian Church, was the bishop of Rome able formally to impose upon the Church of Constantinople the removal from the diptychs of two imperial namesthose of Zeno and Anastasius and of five successive Byzantine patriarchs; however, this is precisely what occurred in 519, when the Roman legates, met by the comes Justinian ten miles away from the city, restored communion between the "two Romes " on the basis of the strict adherence to the decrees of Chalcedon, which, according to the popes, had been betrayed by Zeno's Henotikon . However, Justinian's attitude toward the Church of Old Rome, which will be inherent in his dealings with the East as well, can be fully understood only against the general background of his view of the Christian oikoumene . And there is no alternative for me but to quote here the famous preamble of his edictalso known as the Sixth Novella addressed on April 17, 535 to Epiphanius of Constantinople: "There are two greatest gifts which God, in his love for man, has granted from On-high: the priesthood and the imperial dignity. The first serves ( ύπηρετουμένη ) divine things, while the latter directs and administers human affairs; both, however, proceed from the same origin and adorn the life of mankind. Hence, nothing should be such a source of care to the emperors as the dignity of the priests, since it is for their (imperial) welfare that they constantly implore God. For if the priesthood is in every way free from blame and possesses access to God, and if the emperors administer equitably and judiciously the state entrusted to their care, general harmony ( συμφωνία τις αγαθή ) will result and whatever is beneficial will be bestowed upon the human race'' (3). To understand the full significance of this text it is important to remember that it is only a preamble to a longer constitution on church discipline where Justinian defines what he means by the "dignity of the priesthood"; the real object of the Sixth Novella is to legislate on the marital status of the clergy, on Church property, on episcopal residence, on clergy selection and education, on obstacles to ordination, and on the legal status of the clergy. These legal measures which constitute the real core of the Sixth Novella are essential for the appreciation of what the preamble really means. Obviously, human affairs, which the Emperor considered as being within his imperial competence, included all the legal aspects of the Church's structure, while the "divine things which were, according to the preamble, in the jurisdiction of the priesthood, consisted exclusively in "serving God, i.e., in praying and in performing the sacraments. The "harmony itself mentioned in the text, is not a harmony between two powers, or between two distinct societies, the Church and the State, rather, it is meant to represent the internal cohesion of one single human society, for whose orderly welfare on earth the emperor alone is responsible. In Justinian's legal thinking there is actually no place at all for the Church as a society sui generis. The Empire and the Church are one single body of the faithful administered by a twofold, God-given hier­archy (4) ; theoretically, a duality is preserved between the imperium and the sacerdotium , but inasmuch as the priesthood's role is to deal with divine things, it has almost no legal expression; in Justinian's mind the law governs the entirety of human polity, and the emperor is sovereign in issuing laws. Ecclesiastical traditions and conciliar decisions are made laws by imperial decree, but they have no legal and binding existence by themselves. Justinian's attitude toward the Bishop of Rome is to be understood in this framework. He knows of the " Petrine , or "apostolic, theory of Roman primacy and has no difficulty in speaking about it, precisely becausein his mindonly imperial authority can give it a binding force, relevant to "human affairs. And because the authority of the Bishop of Rome is important for his political plans, he is ready in 519 to sacrifice the dignity of the patriarch of Constantinople to win the Pope's support. Popes John I and Agapet who visited Constantinople in 525 and 536 respectively in the rather humiliating capacity of ambassadors of the Arian Ostrogothic kings Theodoric and Theodahad , were the objects of the greatest attention and their primacy was recognized. The political mission with which the Goths had entrusted them failed in both cases, but their religious leadership was emphasized, as if to prepare the Church of Rome for the role it would have to play in the Orthodox empire after the victory in Italy. Meanwhile, a few years later, when the pope was firmly integrated into the imperial system, Justinian has no scruples whatsoever in forcing the unfortunate Vigilius to comply with his policy of unifying Eastern Christendom. And actually, in his edict of 545 ( Novella 131), he solemnly integrates in the laws of the Empire the political principle of precedence between the major sees, as opposed to the "apostolic principle upon which, especially since St. Leo the Great, the popes were insisting. The edict of 545 confirmed canon 3 of Constantinople and canon 28 of Chalcedon, giving to the patriarch of Constantinople the second rank after the "Old Rome (5) . The principle obviously implied the politico-religious ideology ex­pressed in the Sixth Novella : one single emperor and five patriarchs, ruling over one single society of Christians. It is with those five patriarchs that Justinian will attempt to solve the religious problems of his reign. His edict of 543 against Origen is thus addressed specifically to them (6) , and soon Byzantine texts will consider them as the five senses of the Empire's body. These and many other facts are plainly sufficient in themselves to accredit the view that the Byzantine theory on the relations between Church and Stateor rather on the absence of such relations, since Church and State were integrated in each othercan be defined in terms of  caesaro-papism . However, the danger of associating a historical situation of the fifth or sixth century with the notion of  papism a Western Latin phenomenon which took final shape only in the eleventhis rarely avoided by those who speak of Byzantine  caesaro-papism . The notion of  papism  implies the acknowl­edged existence of a supreme religious power, invested with the legally recognizable right to define matters of faith and morals. Now, the autocracy of the Christian Roman emperors, to which Justinian gave legally its articulate and universal form, and which was shaped along the lines of an earlier Hellenistic tradition of sacralized political power, had constantly to face widespread opposition, especially in the East, from broad masses of Christian clergy and laity who failed to accept the idea that matters of religious faith were to be solved by a single infallible authority. To quote T. M. Parker, theological controversies in the East were an inextricable mingling of politics and religion at all times, complicated by a participation of laity, as well as clergy, in doctrinal disputes to a degree rarely, if ever, to be found in the West (7). Any state, but especially the Roman Empire, and more especially under Justinian, naturally tends to establish, in all the spheres of human life it is able to control, an order governed by law. When he envisaged the Empire and Church as one single society, Justinian could not avoid what for him was an obvious obligation, i.e., to extend the competence of law to the sphere of religion.  Caesaro-papism  was therefore built in to the legal scheme which was governing his legislative and political activity. But this scheme had not taken into consideration a fact which was especially true in the East: Christianity was not, in its very essence, a religion of legal authority. Even when the majority of the episcopate tended to follow imperial decrees, there could arise a force of passive resistance which, if more amorphous than Western insistence upon the rights of the ecclesiastical power, was just as deadening to the blows of Erastianism  (8) . This passive resistance is what kept Egypt essentially Monophysite , in spite of violent imperial pressure, and it is also what kept Constantinople Chalcedonian under the reign of Anastasius . Both Monophysites and Dyophysites were in agreement on principleto deny anybody's absolute authority in matters of faith: It is not my purpose to determine here whether their respective convictions were determined by true or false belief, by social or economic conditions, or by political factors, but the historical facts seem to lead unavoidably to the conclusion that there was no automatic, external, and universally recognized criterion which in the time of Justinian could solve doctrinal disputes. The power of the emperor, in various forms, applied with various degrees of intensity and pressure, naturally claimed to be such a criterion, but imperial autocracy was moderated by the absence, among Christians, of any moral or theological obligation to believe that the emperor had the power to define Christian dogma. Between the legal structure of the Empire, under the absolute rule of the emperor, and the nature of the Christian religion itself, there remained a gap which texts like the Sixth Novella were unable to fill completely: what legal texts could do practically was to give to the emperor the absolute upper hand over the management of Church hierarchy and institutions, but not power over the content of the faith. By appointing the right men in the right ecclesiastical positions, the emperor could certainly influence doctrinal definitions, but the definitions themselves, even when included by the emperors in the Corpus juris , were not understood as sources of new religious beliefs, but as valid, or invalid, necessary, or unnecessary, expressions of a faith which, in principle, had to remain unchanged and was simply supposed to have been "handed down from the Apostles of Christ to later generations. There was, and there will always be in Byzantium, a gap between Roman law and Christian faith (9). The existence of such a gap is best illustrated by the difference with which the role of the emperor in Church affairs was treated in the legal documents on the one hand and in theological literature on the other. While texts like the Sixth Novella, or the official court acclamations, or even the minutes of ecumenical councils convened by the emperors and run in accordance with legal procedures, emphasize the imperial power of judgment and decision, the writings of the theologiansto whatever theological faction they may belongtreat of the doctrinal issues themselves with practically no reference to imperial authority. Certainly, imperial interventions in religious affairs may also have had a negative effect: non-theological, political, or nationalistic motives may have contributed to place a particular geographic area or a group of sectarians in opposition to the imperial Church. But A. Η . M. Jones has shown in a way which, at least to me, seems convincing that the evidence for nationalism of any kind in the later Roman Empire is tenuous in the extreme. The nationalist and socialist theories [explaining the schisms], he continues, seem to me to be based on a radical misapprehension of the mentality of the later Roman Empire. Today religion, or at any rate doctrine, is not with the majority of people a dominant issue and does not arouse major passions. Nationalism and socialism are, on the other hand, powerful forces which can and do provoke the most intense feelings. Modern historians are, I think, retrojecting into the past the sentiments of the present age when they argue that mere religious and doctrinal discussion cannot have generated such violent and enduring animosity as that evinced by the Donatists , Arians, or Monophysites , and that the real moving force behind these movements must have been national or class feeling.... I would maintain that when the sectarians declared, as they did on our evidence declare: We hold the true faith and are the true Church; our opponents are heretics, and never will we accept their doctrine or communicate with them, or yield to the impious government which supports them,' they meant and felt what they said (10). Each party, one may add, readily used imperial authority if it was aiding them against their opponents. Thus Monophysitism can hardly be defined simply as an anti-imperial movement: Monophysite leaders even canonized Anastasius and also Theodorafor the help they received, and how gladly from these imperial figures. Here is one of the most obvious signs of true greatness that cannot be denied to Justinian: he was, or became, himself aware of the unavoidable limitations of his power in doctrinal matters. Certainly, he fully used his authority at all times, as had his predecessors; his doctrinal edicts, his ruthless dealing with recalcitrant popes, patriarchs, bishops, and any other opponents prove it. But he did not stop there, as did Zeno and Anastasius . He also tried to contribute to a solution of the theological issues themselves, not by authority or repression alone, but by pushing Christian thought forward. The great Council gathered in Chalcedon in 451 was the largest Christian assembly ever held until then. Its proceedings were more orderly and regular than those of others councils; they allowed room for discussion, for study of texts in commission, and they resulted in a Christological formula which has always been admired for having appropriated, in a careful and balanced way, the positive elements found in both the Alexandrian and the Antiochian Christologies . 1.The Nicaean Creed had spoken of the Son as consubstantial' with the Father: Chalcedon, in order to affirm that in Jesus Christ there were indeed two natures, the divine and the human, proclaims that He was consubstantial' to the Father according to His divinity and consubstantial to us according to His humanity. Implied in this definition was a condemnation of Eutyches . But, in affirming that the Son with the Father had one substance, Nicaea was following the essential Biblical monotheism: there is one God. However, by saying that Christ was consubstantial to us, was Chalcedon implying that there was also one man ? Obviously, further clarification was needed on the point of how the three are One in God, but the many are not one in humanity. 2. The Council of Chalcedon took the crucial option of speaking of Christ as being in two natures ( εν δύο φύσεσιν ), while Dioscoros of Alexandria and the Monophysites were ready to accept the milder Cyrillian formula of two natures ( εκ δύο φύσεων ), which would actually permit them to say that in Christ the union of two natures resulted concretely in the one nature of the Word incarnate. The Chalcedonian option, which is really the dividing point between the Monophysites and the Orthodox, implies that Divinity and humanity, while united in Christ, did not merge into each other, but retained their essential characteristics. However, the Council was also very careful to maintain the Cyrillian intuition of the One Christ', the term ό αυτός (the same) is used eight times in the short crucial paragraph of the Definition in order to affirm that the Same One was born of the Father before the ages and born of Mary the Theotokos  in the latter days. However, it is precisely the word nature ( φύσις ) that Cyril was using to designate this identity of Christ, and nature was interchangeable with another term ύπόστασις  · when Cyril wanted to emphasize the concrete reality of Christ's person (11) . In Antioch meanwhile, the unity of Christ was designated by the word πρόσωπον : Theodore of Mopsuestia and, after him, Nestorius had spoken of the  prosopon of union in which, or through which, Divinity and humanity existed together in Jesus Christ. The Chalcedonian formula introduces a terminological revolution by identifying πρόσωπον and ὑπόστασις : the two natures of Christ, it proclaims, while preserving their properties, meet in one prosopon or hypostasis. This identification obviously aims at being faithful to Cyril, without shocking the Antiochenes . However, what the formula does not say explicitly is whether the one hypostasis of Christ designates the pre­existing Logos, one of the Divine hypostaseis the same one born of the Father before the agesor the Antiochian  prosopon of union, i.e., the historical Jesus only. These ambiguities of the Chalcedonian formula were to be exploited by the Monophysite theologians for almost a century. The tremendous success of Monophysitism would be due also to the surprising lack of major theological minds in the Chalcedonian party: under the reigns of Leo I, Zeno, Anastasius , and Justin I, no one among the Chalcedonians could even approach the theological brilliance of a Philotheos of Mabbug or a Severus of Antioch, the leaders of the Monophysite party. Ι . The strict Dyophysites  (I prefer this term to the designation strict Chalcedonians  used by Charles Moehler (12) and others, which implies an anticipated conclusion) considered Chalcedon as a sanction of Antiochian Christology. The first and greatest representative of this school of thought was Theodoret of Cyrus, the former friend of Nestorius and principal opponent of Monophysitism before and at Chalcedon. The Council had lifted the ex- communication which Dioscoros had launched against Theodoret at Ephesus in 449, and the latter survived Chalcedon for more than fifteen years, during which period he never stopped writing, and enjoyed increasing prestige. At Chalcedon, he was forced, much against his will, to anathematize Nestorius, but he neither officially recanted his theological criticism of Cyril nor refrained from using a purely Antiochian Christology, with polemical anti- Cyrillian undertones. The continuous identity of his christological position is best illustrated by his attitude toward so-called  Theopaschite  formulae, i.e., all expressions which said, or implied, that the Logos, being in the flesh, truly died on the cross, e.g., that the subject of Christ's death was the Logos himself.  Theopaschism , however, was indeed the position of Cyril, which he actually read in the Nicaean Creed itself, where passion and crucifixion under Pontius Pilate are predicated to the Son of God. Consequently, in his twelfth Anathema against Nestorius, Cyril proclaims: If anyone does not confess that the Word of God suffered in the flesh, was crucified in the flesh, tasted of death in the flesh and became first born of the dead, since He, as God, is Life and life-creating, let him be anathema (13 ). Theodoret's negative attitude toward Cyril's position on this remained constant before and after Ephesus as well as before and after Chalcedon: in his refutation of the Anathematisms , as well as in the synopsis of theology known as the Haereti - carum fabularum compendium and published around 453, he rejects  Theo­paschism  with the same virulence. An argument based on a Platonic concept of manan immortal soul imprisoned in a mortal bodyplays an important role in Theodoret's thought. The resurrection, he argues, was the resurrection of the body of Christ, not that of His soul, or of Divinity; for if the soul is immortal, how much more Divinity? The death of Christ was a separation between the soul and the body; His resurrection, their reunion through the power of Divinity which remained attached to both (14) . According to Theodoret , it is obviously inappropriate to speak of the death of God. Maintaining contacts with the Nestorians in Persia, he explained to them his interpretation of Chalcedon: the concept of one hypostasis in Christ, he wrote, is used by the Council in the sense in which Theodore of Mopsuestia used prosopon , and the definition is nothing else than the vindication of the old Christology of the school of Antioch (15 ). Following Theodoret , an uninterrupted line of strict Dyophysites  can be traced from the time of Chalcedon to the reign of Justinian. It includes several patriarchs of Constantinople, notably Gennadius (458-471) and Macedonius (495-5 11 ), and it is well represented in the polemics against the interpolated Trishagion . When Peter the Fuller, patriarch of Antioch, added to the famous hymn sung at Chalcedon, Holy God, Holy Mighty, Holy Immortal, have mercy upon us the sentence: Who was crucified for us, he faced the fiercest opposition on the part of the Chalcedonians . The existence of this form of Chalcedonian Christology, which we call strict Dyophysite  gave much ground to the contention of the Monophysites that Chalcedon was actually a Nestorian council. 2.The Monophysites , in their very opposition to the Council, implied that it had totally betrayed the theology of Cyril of Alexandria. Actually, "strict Dyophysite  theologians like Theodoret and Gennadius , on the one hand, and a leader of Monophysitism like Severus of Antiochwhose views, as brilliantly defined by the classical study of Joseph Lebon (16) , were essentially identical to those of Cyrilon the other, were simply continuing the debate started between Cyril and Nestorius, as if the Council of Chalcedon had solved nothing. Thus, in the eyes of the Monophysites , the position of the Chalcedonian party was at least ambiguous, and this very ambiguity accredited in their eyes the belief that the Council, in spite of the lip service it paid to Cyril, had in fact rehabilitated Nestorius. Their own traditional Christology, based upon the writings of Athanasius and Cyriland also, unfortunately, upon works of Apollinaris attributed to Athanasiuswas dominated by the concern for preserving the continuous identity of the Logos, before, during, and after the Incarnation. The formula of Cyrilone nature incarnate of God the Word became their slogan, and was much more powerful, in the eyes of the masses, than the more rational concern of Chalcedonian Christology to preserve in Christ the active role of an integral humanity. Justinian himself and his theological advisers soon understood that the Monophysite criticisms would not be met with either negative or authoritarian answers alone. They became painfully aware of the fact that Chalcedon, as an independent formula, was not a final solution to the pending Christological issue: that its meaning depended on interpretation. They had to have recourse to constructive interpretations of Chalcedon, the first of which was the Origenistic solution which supplied Justinian with a third possible exegesis of Chalcedon. 3. Concerning Origenism , I shall simply mention that after the publication of authentic works of Evagrius Ponticus (17) it can no longer be said that Justinian, in his condemnationfirst through an edict, then at the Council of 553of Origen and Origenism , was fighting phantom adversaries. What is even more interesting is that a connection seems to have existed between the problem of Origenism and the Christological issue (18). It may even be that the involvement of the Origenists in the debate over Chalcedon added to the effect of the well-known disturbances, provoked by Origenist monks at St. Sabas ' monastery in Palestine, and attracted public and imperial attention on Evagrian doctrines. The solution to the Christological problem proposed by the Origenists , whose main spokesman was Leontius of Byzantium, was based not upon the generally accepted concepts of natures, but upon the Evagrian view that Christ was not the Second Person of the Trinity but an intellect ( νοῦς ) united essentially to the Logos. I mention the problem of Origenism only to stress that Origenistic Christology, very attractive in­tellectually, was far from the accepted criteria of Orthodoxy, and that Justinian and his advisers had to look elsewhere to find a way of expressing a universally acceptable formula of faith. 4. It was therefore a fourth interpretation of Chalcedon which would triumph in the imperial Church in the sixth century, an interpretation which, since Joseph Lebon , is generally called Neo- Chalcedonism . It essentially consisted in denying that Cyril and Chalcedon were mutually exclusive and in promoting the interpretation of the one by the other. According to the Neo- Chalce - donians , the term one hypostasis used by Chalcedon designated not what Theodore of Mopsuestia and Nestorius meant by the  prosopon of union, but what Cyril meant by one nature. Consequently, Cyrillian terminology including the expression one incarnate nature of God the Wordhad to retain its value, even after Chalcedon in an anti-Nestorian context, while the two natures was essential to counteract Eutychian Monophysitism . In other words, none of the existing terminological systems is fully adequate to express the mystery of the Incarnation of God becoming man, but the doctrinal positions of Cyril and Chalcedon each exclude a wrong interpretation of this central issue of the Christian faith, without excluding each other. This negative concern of the Neo- Chalcedonian position, which presupposes a necessary intellectual humility on the part of its defenders, should be kept in mind if one wishes to give full credit to the achievements of the reign of Justinian. Neo- Chalcedonism , however, has not enjoyed great favor among historians in the last decades. It was considered simply as a state-imposed artificial scheme to please the Monophysites and a betrayal of the true Chalcedonian Christology. This critique of Neo- Chalcedonism was partially due to the widespread tendency to rehabilitate the great Theodore of Mopsuestia , teacher of Nestorius, and Nestorius himself. The discussion of these rehabilitations is obviously outside the scope of this paper. I would like to suggest, however, on purely historical grounds, that the Neo- Chalcedonian interpretation of Chalcedon would probably have found no opposition whatsoever in the minds of the Chalcedonian Fathers themselves. This observation is suggested by my reading of the conciliar acts. The vast majority of the Council of 451 was Cyrillian . It almost approved the formula of two natures, which was Cyrillian and which Dioscoros of Alexandria would have accepted. When the decisive influence of the famous Tome of Leo, addressed by the Pope to Flavian of Constantinople, in favor of the final Chalcedonian formulation began to gain ground at the second session, the faith it expressed was acclaimed by the assembly as the faith common to Leo and to Cyril. And when representatives of the Illyricum and of Palestine continued to object, the Tome of Leo was entrusted for five days to a special commission which made sure that it coincided with the doctrine of the Twelve Anathematisms of Cyril against Nestorius (19) . It can, therefore, be said that the concern of the age of Justinian to consider Cyril and Chalcedon as one single continuous and coherent development in Christological concepts is not a new idea but was present during the Chalce­donian debates themselves. In any case, the Neo- Chalcedonians of the sixth century would not interpret their own position otherwise, and would not accept that the prefix Neo be used in a sense implying that the Chalcedonian doctrine was fundamentally modified by them. The strength of Monophysitism , its appeal to the masses throughout the East, the well-deserved prestige of theologians like Philoxenus and Severus, and also the extreme weakness of Chalcedonian apologetics, which practically surrendered to the Monophysites the monopoly of Cyrillian orthodoxy, was the theological situation in the Christian East when Justinian came to power. The policy of formal compromise with the Monophysites , practiced by Zeno and Anastasius , had failed not only on theological grounds but because of rigid opposition from Rome. Even if Justinian had wanted to practice the same policy, he could not have afforded it, because the reconquest of Italy, Africa, and Spain made it compulsory for him to espouse a religious policy acceptable to the Christian West. It is at this point that his great dream of a universal empire, united politically and religiously, as well as his personal theological mind which understood well the issues dividing Chalcedonians and Monophysites , were put at the service of a religious policy which led to the Fifth Council of Constantinople (553). The first goal of this policy was to counteract the Monophysite accusation that Chalcedon had betrayed Cyril, and thereby exclude the possibility of interpreting it any longer in the strictly Dyophysite  or Antiochian manner. But Justinian and his advisors were not moved exclusively by the concern of appeasing the Monophysites . They were also aware of the inner weakness and contradictions of the "strict Dyophysite  position itself, which, by denying for example, that it was possible to say that the Logos died in the flesh, was opposing the doctrine of the communication of idioms, or at least reducing it to purely verbal and nominal expression. For if the Logos, because of His divine nature, could not die, how could He be born of the Virgin? And if it is not He Himself who was born of Mary, how was she to be called Theotokos ? The strict Dyophysite  position was implicitly questioning not only the Monophysite position, but also the Council of Ephesus. Thus, Justinian gave the greatest possible encouragement to those who, in the Chalcedonian camp, defended  Theopaschite  formulae: John the Grammarian, who had published between 514-518 an Apology of the Council of Chalcedon, John Maxentios and the Scythian monks and, later, Leontius of Jerusalem. The formula One of the Holy Trinity suffered in the flesh thus became the slogan of a policy and of a theology to which popes also gave support, since it was found in the Tome of Leo itself (20) . It was also included in the imperial confession of faith which opens the Codex juris . The affair of the so-called Three Chapters created greater problems with the West. We have already seen how strong an argument the Monophysites made of the fact that two friends of Nestorius and critics of Cyril Theodoret of Cyrus and Ibas of Edessahad been admitted in communion by the Council of Chalcedon, and that the great Father of Antiochian Christology, Theodore of Mopsuestia , was widely read in Chalcedonian circles. The question was a difficult one because it touched on the legal authority of the Council: could one condemn these Chapters and keep the Council? It is specifically on these legal groundsmore than on grounds of theologythat Justinian encountered Western opposition to his project of condemnation. He had to resort to rather direct means of action: the deposition of a pope, the installment of anotherand face the unexpected six-year-long resistance of his and Theodora's candidate to the papacy Vigilius . Fin all y the papal confirmation once given, the West remained reticent for a long time still and perhaps never really appreciated the theological implications of the decisions of 553. However, the Fifth Council, formally, has not infringed on the authority of the Fourth: the acceptance of Theodoret and Ibas into communion was not put into question, but only their writings against Cyril. Theodore of Mopsuestia alone was the object of a personal posthumous condemnation (21) . Besides the condemnation of the Three Chapters, the conciliar decisions formally endorse the essential positions of Cyril of Alexandria: unity of Christ's being, hypostatic identity between the Christ of history and the pre-existent Logosthis unity and identity being expressed in  Theopaschism . This endorsement of Cyril's theology obviously implied at least some accredita­tion of Cyril's theological vocabulary: thus, the Council formally admits that one uses such Cyrillian formulae as of two natures ( εκ δύο φύσεω ν ) and one nature incarnate of God the Word ( μία φύσις Θεού λόγου σεσαρκωμένη ), provided that one shall understand those expressions as the holy Fathers [i.e., of Chalcedon] have taught ( anathematism 8). The implications of this decision are of great importance: the Council, in fact, disengages theology from words and formulae and affirms that what matters is only their meaning. This attitude is in itself an important change from the usual practice of the post- Constantinian imperial Church. The Monophysites are not requested to abandon overnight the theological vocabu­lary in which they are trained, but simply to understand and accept as well the Chalcedonian concern for preserving in Christ the fulness of active and authentic humanity. Unfortunately for Justinian, the Council of Chalcedon had become, for the Monophysites , and especially for the Egyptians, a symbol of both  Nestori - anism whatever the content of that term may have beenand of the bloody repressions which had been directed against its opponents. Some of them will accept reconciliation only when, a century later, a really decisive concession will be made by the Chalcedonians in the Monothelite Ekthesis of Heraclius (637) and the Typos of Constans II (647 or 648). Thus, Justinian's dream of a universal empire, uniting both East and West into a symphony based upon one single faith, proved unworkable. Problems of religious faith proved to be irreducible to the legal structure of the State. Consequently, the persistence in Byzantiumand under another form, in the Medieval West as wellof the utopian aspiration to identify Church and State, the kingdom of God with the earthly kingdom, dogma with law, political loyalty with religious truth, only favored and embittered divisions in Christendom. It is against the background of this fundamental failure of the Justinianic imperial idea that his achievements also become discernible. The switch of emphasis from formulae to content, which we have just noted in the decisions of 553 , was in itself an admission on the part of the Emperor himself that theological issues could not be solved by state legalism. This content of Christian theology of the Justinianic age deserves, especially in our times, greater appreciation than it is generally given. Our time becomes increasingly estranged from a theology which considers God and man as two distinct, philosophically definable entities, with in­compatible characteristics, such as passibility and impassibility, capacity for change and changelessness, composition and simplicity. It becomes increasingly evident that these categoriesat least when they are given absolute value belong to a particular philosophy and are thus historically conditioned by the frame of mind which produced them. In order to understand the theological achievements of the age of Justinian, one has to give full credit to the Cyrillian and Justinianic conception of Christ: the God-man, whose divine nature remains totally transcendent in itself and which therefore cannot be defined philosophically, but whose divine Person, or Hypostasis, somehow leaves the category of the transcendent and fully assumes a human nature and an immanent condition to the point of really dying in the flesh. God himself therefore ceases to remain in heaven, bound by philosophical notions, a prisoner of His own transcendency , becomes fully compatible with suffering humanity, and makes it His own. Obviously, Justinian failed to reconcile Eastern Christendom with the West and with itself. The social and political consequences of the final secession in the East of a vast majority of non-Greek-speaking Christians from the imperial Church will be incalculable. But it is also important to recognize that the great debates of Justinian's reign were theologically among the most fruitful of Christian history, and may prove to be of special and rather unexpected relevance in the light of our own modern categories of thought. (1) Dumbarton Oaks papers , 6 (1951), p . 1-23. (2) Codex Justinianus , I . i , 7, Paulus Krueger ed ., in Corpus juris civilis , II ( Berlin , 1929), p . 11. (3) Novella VI , Rudolfus Schoell , ed . in Corpus juris civilis , III ( Berlin , 1928), pp . 35-36. Cf. the excellent analysis of this and parallel texts of Justinian in F. Dvornik , Early Christian and Byzantine Political Philosophy. Origins and Background, Dumbarton Oaks Studies, IX, 2 (Washington, D. C., 1966), pp. 815-819. (4) A good general discussion of Justinian's thinking on this point in A. Schmemann , The Historical Road of Eastern Orthodoxy (New York, 1963), pp. 144-153. (5) Corpus juris , ed. cit ., p. 655. (6) PG 86, cols. 945 D, 981 A. (7) Christianity and the State in the Light of History (London, 1955), p. 78; cf. also L. Bréhier , Les institutions de l'Empire byzantin (Paris, 1949), p. 195-200; F. Dvornik , The Circus Parties in By¬zantium ,'' in Byzantina-Metabyzantina , I, pt. 1 (New York, 1946), pp. 119-133. (8) Parker, 1955, op. cit., p. 74; cf. L. Bréhier , op. cit., p. 441 . (9) In a sense, this gap coincides with the old Roman distinction between potestas , effective power, and auctoritas , moral prestige, as represented in the letters of Pope Gelasius to Anastasius I; cf. E. Caspar, Geschichte des Papsttums , 2 (Tubingen, 1933), p. 65 seq., and F. Dvomik , Early Christ, and Byz . Polit. Philos ., pp. 804-809. (10) Were Ancient Heresies National or Social Movements in Disguise ?, The Journal of Theological Studies, N.S., X, pt. 2 (October 1959), pp. 297-298. (11) Cf. Aloys Grillmeier , Christ in Christian Tradition from the Apostolic Age to Chalcedon (451), trans. J. S. Bowden (New York, 1965), pp. 409-412. (12) "Le Chalcédonisme et le Neochalcédonisme en Orient de 451 à la fin du VI e siecle , in Grillmeier - Bacht , Das Konzil von Chalkedon , I ( Wurzburg , 1951), pp. 637720. (13) Acta conciliorum oecumenicorum , ed. E. Schwartz, I, 1, p. 92. (14) The refutation of Cyril's anathematisms , Migne , PG, 76, cols. 404C, 449BC, etc. Haer . Fab . Comp ., V, 15; PG, 83, cols. 504B-505A. (15) Letter to John of Aigaion , in F. Nau , "Documents pour servir a l'histoire de l'6glise nestorienne, in Patrologia Orientalis , XIII (Paris, 1919), pp. 190-191; cf. M. Richard, "La lettre de Théodoret a Jean d' Egées , in Les sciences philosophiques et théologiques (= Revue des Sc. phil . et théol . ), 30 (Paris, 1941-1942), pp. 415-423. (16) Le Monophysisme sévérien: étude historique, littéraire et théologique sur la résistance monophysite au concile de Chalcédoine jusqu'à la constitution de l'église jacobite (Louvain, 1909). (17) Cf. Antoine Guillaumont , Les Kephalaia Gnostica d' Evagre le Pontique et l'histoire de l' Origénisme chez les Grecs et les Syriens (Paris, 1962). (18) This connection will be discussed in Leontius of Byzantium, An Origenist Christology, by David B. Evans, to be published as number XIII in the series of Dumbarton Oaks Studies. (19) ACO, ed. E. Schwartz, II, i, pt. 2, pp. 82-83. (20)  Filius Dei crucifixius dicitur et sepultus , in ACO, ed . E. Schwartz, II, 2, pt. I, p. 28. (21) I discuss at greater length the decisions of 553 3-nd the entire Christological problem under Justinian in my book on Christ in Eastern Christian Thought after Chalcedon, to appear in 1969, under Corpus Books, in Washington, D.C.